Located in St. Charles County real estate, homes for sale in Foristell MO are located close to two major highways leading into St. Louis County/City. Foristell Real Estate is made up of both newer homes and older homes on acreage as the St. Charles area was rural just 15 years ago. Foristell MO Real Estate and Foristell MO properties are a perfect addition to the St. Louis Real Estate market. Foristell real estate average home age of 16 years. Homes for sale in Foristell MO range in price from $75,000 to $650,000. The median home price in 2014 was approximately $225,000. Foristell is primarily residential and is located on the St. Charles County border at Warren County. The area has a country charm and is home to beautiful rolling hills and countryside. Foristell properties are served by two school districts, Wright City and Wentzville. See Great Schools for up to date ranking on every school in the area. If you are looking for a home for sale in Foristell MO or you would be interested in buying a home in Foristell, please contact St. Charles real estate expert, Sharon Colona and St. Louis Realty for a professional and simple buying or selling process. Call (636) 397-7653 or email at scolona@stlouisrealty.net. If you have been looking for that Rare and Exceptional home on acreage with no subdivision rules to cramp your style... this is it!! This home has it all!! 6+ Acres, blacktop road and drive, in-ground pool with party pavilion, large detached garage/outbuilding combo for all your toys and an interior that is fit for a King... or Queen... or Both! Oh, and did I mention that it is exceptionally private, has all new kitchen appliances and has AAA rated Schools (Wentzville School District!) Easily accessed off Hwy 61 and just a few minutes North of I-70. This country palace is sure to be the place you can call home and be proud to entertain your friends and family. Nothing short of exceptional in every way! Come see what you have been looking for... you wont be disappointed. Fabulous 1.5 sty home on 8.870 acres w/2 acre stocked lake. Two sty entry w/French doors leading to dining room & two sty greatroom w/floor to ceiling brick fireplace and doors to deck. Kitchen has 42 x201D; cabinets, granite, high end ss appliances, subzero refrigerator stays, center island and main floor laundry. The master suite has coffered ceiling, walk in closet, luxury bath and door to deck. There are two additional bedrooms and a full bath on the upper level and an office nook. The lower level in a walk out and has a media room, 4th bedroom, third full bath and a family room with wet bar and pool room. This is a very charming and entertaining home! Features include, newer composite decking w/rain helmet under deck flooring, zoned HVAC, 30 x30 gazebo, Sun screens and awnings , two car over sized garage plus a detached garage. This home is suitable for horses. Gorgeous Custom Built Ranch home with 3 bdrs/2.5 baths nestled on 5 acres. Entering through the front door you'll be impressed with the sprawling Open Floor plan with 10' ceilings & 3/4 wide plank Hickory hard wood floors. The Great Rm has a Gas f/p & opens into the Large Kit & Hearth Rm area. The Kit features custom 42 cabinets, large center island with bar top, subway tile backsplash, high-end S/S appl's & Granite counter tops. The divided bedroom floor plan has a huge Master suite with 9x8 walk-in closet & a luxurious bath with adult height His/Her Vanities & custom walk in shower with dual shower heads & body sprays. There are 2 add'l bdr's with walk in closets. Office/Den on the main floor that can be closed off when working using the custom barn doors. Out back features a great entertaining area that's partially covered and has a wood burning Stone f/p and infrared Heaters in the ceiling. O/S 3 car garage (36'x25') with 9' high doors and extra wide. Walkout LL and H/E HVAC. Rare Find!! Country living in the City! You will enjoy the peacefulness of the country while having the conveniences of the city. This beautiful landscaped 6.4 acres has a beautiful updated custom built 1.5 story house complete with 5 large bedrooms with main floor master and main floor laundry, two story great room, 4 baths, 2 fireplaces, updated kitchen with granite counter tops and finished walk out lower level great for family gatherings and entertaining, with a large bedroom and private bath for guest. Hugh out building to use as work area or extra garage. Relax on your oversized deck and enjoy the wildlife. The geothermal system makes your utilities very minimal. The home is very private!! Don't miss this rare opportunity! MAKE YOUR APPOINTMENT TODAY TO SEE THIS BEAUTIFUL HOME!! Move in just in time to enjoy your fun filled summer!! Sellers raised their children here and now would like to down size. Hurry before this one gets away!! Highly Motivated sellers!! This custom Certified ranch on 3 acres shows like new! Certified home includes completed appraisal, inspection & home warranty. Gorgeous hardwood floors flow thru main floor formal dining rm, hearth rm, living room, gourmet kitchen, office & 3 bedrooms. See-thru gas fireplace opens to Large maintenance-free deck. Wood burning fireplace in hearth rm. Open concept kitchen includes Viking appliances, double oven, 2 dishwashers, large center island, hand-crafted cherry cabinets, granite countertops. Master has custom W/I closet & on-suite bath with W/I tile shower. Main floor includes J/J bedrooms & baths. Finished LL w/o features screened-in room leading to outdoor stone patio & serene waterfall. Large bedroom, full bath, rec area w/ pool table, large living area w/ stone-wrapped electric fireplace, office & custom bar complete LL. 3 car side entry, new septic, tankless water heater & more. Too many amenities to list. THIS HOME IS GEOTHERMAL.. Just 10 minutes from Wentzville Pkwy but with the privacy of your own estate! Close to all major hwys including 70, 40 and Page Ext.... Fabulous custom built ranch on 3+ acres. Home has several upgrades.. Open floor plan, custom hardwood flooring and woodwork, gourmet kitchen with custom cabinets and walk in pantry, hearth room with woodburning fireplace, large main floor laundry, 3 large bedrooms on main floor with master bath suite, large walk in closet, full hall bath with large sunk in tub and shower, 4th bedroom in walkout basement, office/den in basement, family/rec area with wet bar, central vac, tons of storage space... detached garage with additional 2 car space, gorgeous lot backing to woods, covered patio perfect for entertaining and more! One owner and they did not miss an upgrade when building this custom home! Must see this one won't last long! COUNTRY LIVING but close to the city--less than 15 minutes from Wentzville shopping. This stately 1.5 story home located on 12.87 acres has over 3600 sqft living space with a full walkout basement. It features a remodeled kitchen with quartz counter-tops and tile backsplashs. Beautiful hardwood floors throughout the main level. Perfect for entertaining with separate dinning room with big bay window. Open floor plan offers kitchen/breakfast/family area with wood burning fireplace. A large great room with 2nd fireplace offers a number of uses--recreation room or family TV room. This home has plenty of storage space, 4 bedrooms, 3 full bathrooms and 3 one-half bathrooms. A large sun-room with both heat and air conditioning can be become an exercising room or a great hobby room. The grounds are a perfect setup for a horse farm with fencing and a stocked shared 7 acre lake. A detached 34 X 24 work shop has two additional parking spaces. AN AFFORDABLE HOME WITH ACREAGE--A RARE COMBINATION! Make an offer! Enjoy the country+convenient access to grocery stores, shops & major commuting routes. Best of both worlds! 4- acres, w/a mix of trees & open ground, this home will provide you the peace you deserve. 9' tall ceilings throughout main level. NEW wide plank laminate hardwood stretch across the main level. Entire home is freshly painted. Kitchen features plenty of white cabinetry, stainless appl. (dbl oven, smooth top range, micro, dw & fridge negot.) planner desk & butterfly island. Main level owner's suite has private bath w/sep. tub & shower+HUGE walk-in closet. Main level includes office/dining rm, 1/2 bath, great rm w/fireplace & laundry rm. Upper level features loft area overlooking backyard, 3 massive bedrooms & a full bath. All NEW carpet. Lower level is partially finished. French doors off breakfast room lead to STAMPED concrete patio that spans the length of the home. Property can accommodate chickens w/NEW coop & run (negot.) already on property. Gorgeous Custom Victorian, 3-story, waterfront home on a 4 acre lake in Incline Village. Covered wrap around porch, 2x6 exterior walls, 9' ceilings, custom millwork, Wood floors, abundance of windows, formal dining room, living room, 2-story entry foyer. Stunning Kitchen with 42 cabinets, granite, gas cook top, built in oven & microwave, center island, walk-in pantry, incredible breakfast room surrounded by windows. Great room w/wet-bar, builtin cabinetry/bookshelves, large bay window, gas fireplace & atrium door to deck. Second level boasts a master bedroom suite w/walk-in closet, coffered ceilings, master bath w/double sinks, claw tub, separate shower. Two additional bedrooms, hall bath & a beautiful den/loft area overlooking entrance foyer. Third floor features large bedroom. Walk-out Lower level has a family/rec room & bonus room, storage locker that opens from the outside for lawn equipment. Stationary dock. Resort community with several lakes, clubhouse, tennis court & golf. Don x2019;t miss your chance to tour this well-appointed brand new Foristell home. This fantastic property is turn-key ready and loaded with features. The exterior of this home features brick/maintenance-free siding and features a large three car garage. As you make your way inside you will fall in love with the open floor plan and soaring ceilings. Family room features electric fireplace, coffered ceiling, recessed lighting and crown moldings. Through the family room, you will find a large kitchen/breakfast room featuring granite countertops, stainless steel appliances, under-cabinet lighting and desk area. You x2019;ll fall in love with the large master bedroom that features coffered ceiling, crown molding and a beautiful ensuite that includes a dual vanity, jetted tub and enormous stand-up shower. Through the master bath, you x2019;ll find an enormous walk-in closet. Home also features a main floor laundry, two large additional bedrooms and a walkout unfinished basement with 10-foot ceilings. Stonemoor Sales Center open Tuesday - Sunday 11am-4pm. This Craftsman Model by Zykan & Son's Homes is completed and ready for you to call home! This home is packed with upgrades including 3/4 staggered width hardwood floors, upgraded cabinets and vanities with dovetail drawers and soft close doors and drawers, HUGE island, black stainless appliances w/ slide in gas range, 4pc crown molding, 9ft ceilings throughout w/ 10ft ceilings in the great room and coffered ceiling in the master, gas fireplace w/ floor to ceiling stone surround, built in lockers in mud room, both bathrooms have tile floors and dual adult heigh vanities with onyx vanity tops, separate tub and shower in master bathroom with onyx surround, spindle staircase, oil rubbed bronze package, upgraded lighting package, wood trim around all windows in main living area, gorgeous front elevation with stone entryway, 8ft garage doors with openers, humidifier, and so much more! Home will be fully sodded. Astonishing ranch, 3 bdrm open floor plan home! This home is a to be built (TBB) , ready for you to customize the finishes to fit your style. This home is our Craftsman Model and has optional elevations available. Pictures depicted show a sample of the options offered as well as standard finishes including hardwood floors throughout, upgraded hardware, gas appliances, 9 and 10 foot ceilings and so much more. Let the pictures entice you. Located in sought after Stonemoor Subdivision. This subdivision is a community in itself tucked across from Rotary Park with a subdivision pool, playground, basketball court, elementary school. Come see all this neighborhood has to offer! Gorgeous Foristell house has the wow factor throughout and is ready to be your next home. You x2019;ll fall in love with unique x201C;L x201D; shaped design of this fantastic property and it x2019;s extensive features and amenities. Home features a front elevation of stone/brick and low maintenance vinyl siding and sits on the golf course fairway. The interior features an open layout that includes a gorgeous family room (w/vaulted ceiling), a large laundry room, two huge bedrooms, wood floors, custom lighting and crown molding throughout. Gorgeous eat-in kitchen features granite countertops, subway tile, stainless steel appliances and custom cabinets w/ in-cabinet lighting. A large master bedroom features crown molding, recessed lighting, coffered ceiling, large windows and a spectacular en-suite that includes a large walk-in sit down shower, dual vanity, huge jetted tub and electric fireplace with big walk-in closet through the next door. A huge walkout basement features 10 foot ceilings. This Atrium Ranch on 4 +/- acre lot w/pond is a dream home! Circle drive, side entry garage and large pad for parking. Shed for storage, bonfire,and within walking distance to Indian Camp Creek Park with horse trails and jogging trails swimming and playgrounds. Over 3000 sq ft of living space including finished LL w/recreation room, fireplace, wet-bar, full bath & 4th bedroom. Kitchen breakfast bar Island, has granite counter-tops w/natural stone backsplash, 42 x201D;custom wood cabinets, walk-in pantry, 2nd pantry, deep composite sink. Stainless-steel appliances include fridge & matchingupright freezer stay. 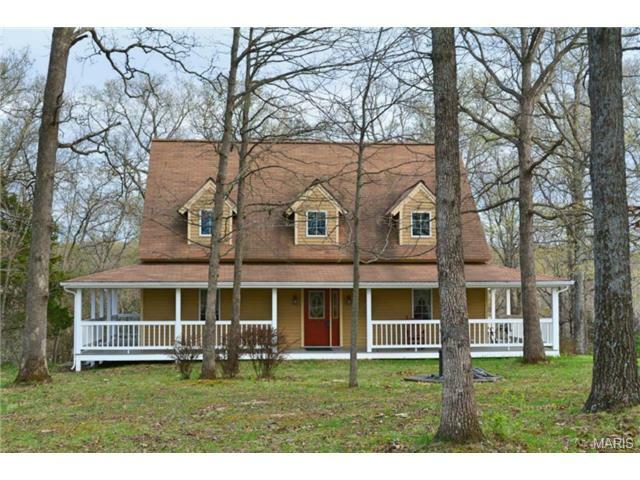 Great room is vaulted w/wood-burning fireplace, wood floors & gorgeous view of treelined pond. Vaulted Master has walk-in closet w/organizing system and walks out to deck spanning the length of house. Professionally updated Master bath has walk-in shower, floor to ceiling marble tiled wall, transom window & 2 quartz-top vanities. More acreage available 3.5 adjoining acres for sale. This beautiful 3 bed, 2.5 home in the very sought after Francis Howell school district is a true oasis & is nestled on 4.1 wooded acres. First walking in the front door, you are greeted by wood accents throughout giving a traditional country feel, while still maintaining a modern touch. The huge great room w/ vaulted ceiling offers a beautiful Woodburning fireplace, making it a perfect relaxing space for the family to relax. The open floor plan flows conveniently into the separate dining room (w/ access to the patio), breakfast area and kitchen. The kitchen boasts gorgeous cherry wood cabinets, all stainless appliances, and a breakfast bar island. You will fall in love with the vaulted master bedroom suite with walk-in closet, massive tiled shower, double bowl square vanity, and separate soaking tub. Direct access to a large cedar deck. The finished basement offers endless possibilities with a half bath, bar, and entertainment area, perfect for entertaining guests. This is a must see! Roomy, comfortable ranch on 1.77 acres in established neighborhood with beautiful mature trees and private neighborhood-only 7-acre lake. xD; xA;Seller installed vinyl siding, gutters & downspouts, and 30-yr. architectural shingle roof with ridge vent. xD; xA; xD; xA;Backyard includes apple trees and approx. xBD; acre fenced yard with 5-ft. chain-link fence with gate to back of property. xD; xA; xD; xA;Nice view of neighbor x2019;s lake from kitchen and family room windows and back porch. Pella windows in all bedrooms and over kitchen sink. xD; xA; xD; xA;Laundry room has door to outside onto back porch. xD; xA; xD; xA;Master bathroom has been remodeled. xD; xA; xD; xA;Family room has stone wood-burning fireplace with built-in shelves and storage on each side. xD; xA; xD; xA;Second bedroom has custom built-in bookshelves. xD; xA; xD; xA;Oversized 2-car garage with double doors, includes a workshop area and plenty of storage. xD; xA; xD; xA;Recently painted interior and newer carpet.